Research from Purdue University has found Americans are eating about the same number of calories in their meals as in the 1970s, but their caloric intake from snacks has skyrocketed 580 calories (up from 360 calories in the '70s) -- the equivalent of another meal. In addition, the study found the participants spend more time snacking and that sugar-laden beverages make up 50 per cent of the calories we consume outside of breakfast, lunch or dinner. 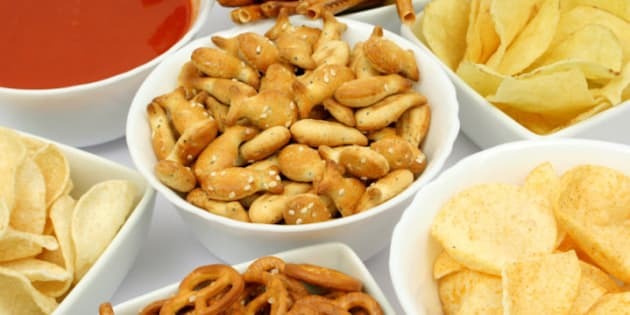 If these findings have you examining your snacking habits, you're probably not alone. Here we grab some snack-smart tips from Edie Shaw-Ewald, a registered dietitian based in Halifax. Don't confuse a snack with a treat. "We often think of snacks as cookies, chips, granola bars... But snacks are different from treats," says Ewald. You can indulge in treats maybe once a week, but snacks you can have every day (they're meant to boost your nutrition and energy levels and your overall health). Know what makes a healthy snack. A snack should be about 150 to 200 calories and ideally it should have a source of carbs for energy and some protein (so that you feel full longer). Keep an apple, banana or a handful of nuts in your handbag. You can make your own trail mix, but watch what you put into it. (Edie says an ideal mix is about a small handful of almonds with about a tablespoon each of raisins and dark chocolate chips.) It might help when it comes to choosing and shopping for snacks to think in terms of the food groups -- buy something that's from one or two of them. This may help you overlook the chips and chocolate that are occasional-type foods, says Edie. Plan ahead. With our busy lives and urban sprawl, we're often far away from home, says Edie, which she feels is contributing to an epidemic of people popping into a convenience store for an unhealthy treat to satiate hunger. When making your grocery list, make a point of thinking of your snacks so you will be prepared for the days ahead. Prep veggies first. If you're ravenous when you get home and tend to grab less healthy choices such as cookies, start your meal preparation by chopping and preparing the veggies that are in your meal so you can snack on them instead. Keep healthy snacks handy. Having your nutrient-dense snacks front and centre in the fridge and a fruit bowl on the kitchen counter may help you make better choices when you're feeling that pang of hunger. Better yet, keep the chips and cookies out of the house. It's easier to have them as a special treat occasionally if you don't have a constant supply of them, says Edie. Karen Kwan is a health and lifestyle freelance writer based in Toronto. She also has a blog, Health & Swellness.